Gambell Capt. Ralph E. 1867 1910 Porto Rico Infantry U.S.A.
Geneski Walter F. 1913 ----- W.W.2. Gibson John Apr. 2, 1804 Mar. 24, 1877 born in Croydon, N.H.
Gibson Laura Evans Sept. 15, 1808 Aug. 11, 1878 wife of John Gibson, born in Dalton, N.H.
Gibson Susie June 25, 1879 Sept. 11, 1896 dau. of William & Jennie Gibson * stone says " A Sunbeam that came and went"
Gillespie Lieut. W.C. no dates Co. C. 1st. L.A.
Gillespie Lieut. W.C. no date Co. C. 1st L.A.
Gleason Martin 1845 1935 Corp Co. F.11th Reg. Pa. Cav. Graham Fred A. 1857 1926 an American flag, Legion Marker here. Grinelli Charlotte C. 1838 1901 wife of C.P. Grinelli Kittie Dec. 24, 1871 age worn off dau. of Charles P. & Charlotte C.
Grinelli Lorenzo E. 1878 1898 son of Charlotte & C. P.
Grosjean Otis L. June 22, 1865 (rest buried) son of S.M. & Melissa J.
Guernsey Margaret E. Sept. 12,1829 Feb. 11, 1866 wife of H.A. Guernsey Sadie July 29, 1854 Jan 24, 1864 dau. of H.A. & M.E. Guernsey Willie E. May 31, 1862 Feb. 16, 1880 son of H.A. & M.E. Hart Myrtie 1876 1918 their dau. Hartsell William M. Aug. 12, 1892 July 23, 1962 Texas Horseshoer U.S. Army W.W.1. 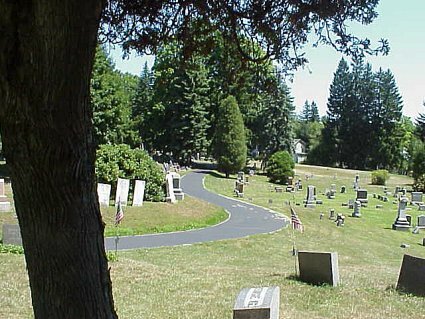 My Great Uncle Claude C. Harding is lying in rest (Mausolium) in the Wellsboro Cemetery. As I view your very well done site, it appears he is not listed. Might he be added? He was born July 03, 1882 and died April 17, 1962. His wife is shown in the cemetery. Laura McCarty Harding. She was born September 09, 1892 and died May 1987. I can't tell you how invaluable your site has been to me in researching my Tioga Co. ancestors, the Butlers and Hardings, and related families. They are in a masoleum. You are the visitor since the counter was installed on December 13, 1997.